Hanover, PA (07/20/18) - David Holbrook started on the outside pole, raced around pole sitter, Joe Trone Jr., and led every lap en route to his second win of the year in the 25-lap Hoosier Tire Mid-Atlantic 358 Sprint Car feature Friday night at Trail-Way Speedway. Trone remained close with Holbrook throughout the race, however each time the leaders approached lapped traffic, a single car spin would bring out the caution flag. The first caution was for Trevin Caruccio who spun in turn two with the second a lap later for Austin Kirby in the same turn. Seven laps later, Caruccio was sent to the pits for bringing out another caution flag, with his second unassisted spin of the feature. The final caution came on lap 21 for eighth running Austen Treuchet. 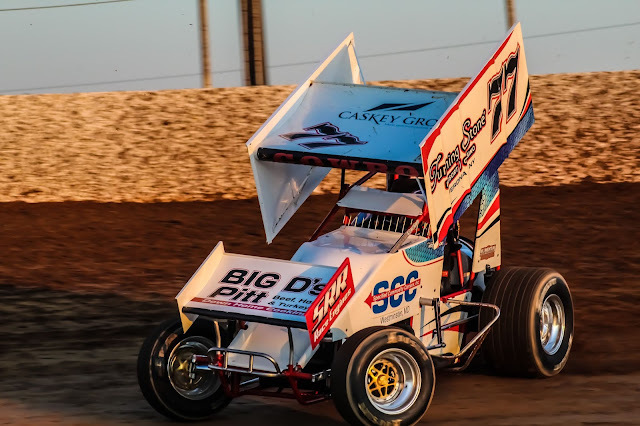 Holbrook’s win also created a two-way tie for the lead in the 358 Sprint Car point standings. Fletcher, who came into tonight’s racing action as the lone point leader, now shares the top spot with Holbrook as only seven races remain in the 2018 season. Trone crossed the line 1.752 seconds behind Holbrook with Dylan Norris finishing third, Fletcher in fourth and in his first race at Trail-Way in a 358 Sprint Car, Dave Brown, completed the top five. The Big Mike’s Crabhouse Hard Charger award went to Wyatt Hinkle, who started 14th and finished 8th. Heat winners for the 17 358 Sprints were Holbrook, Trone and Owings. Cory Myers scored his third win of the year by leading the entire 20-lap Mason Dixon 270 Micro Sprint feature, Friday night at Trail-Way Speedway. Myers started on the pole and was immediately challenged by fourth starting Brian Marriott. However, due to a jump on the initial start, Marriott was docked four positions when Thurmont, Maryland’s Doug Yingling brought out the caution on lap seven. Marriott spent the next seven laps racing his way around Colton Hendershot, Tim McClelland and Steven Cox to once again challenge Myers for the lead. Marriott raced the final laps glued to Myers back bumper, but was unable to complete a pass for the win. Following Myers and Marriott across the line were McClelland, Cox and first time Donahue Motorsports Hard Charger, Brock Whisler, completing the top five. Heat wins for the 23 270 Micro Sprints were won by Joe Long Jr., Hendershot and Myers. Will Walls dominated the 20-lap Precise Racing Products Street Stock feature, Friday night at Trail-Way Speedway. Walls started third, raced around front row starters Jim Jacobs and Sam Gallagher, and never looked back. Jacobs and Gallagher finished second and third, respectively, with Gary Calimer Jr. and Jeremy Stremmel completing the top five. Trail-Way Speedway tech officials conducted a post race engine inspection on Walls’ #21W street stock and the car was found to be in compliance with the track’s rules. Kyle Rohrbaugh claimed his first win of the season in Friday’s 15-lap Limited Stock feature. Rohrbaugh assumed the lead following a lap four caution, which was brought out by point leader and racelong leader, Robbie Carroll. Carroll’s #69 Limited Stock slowed significantly after the throttle body broke, causing him to retreat to the pit area. Completing the top five was Jason Chronister, Matt Worley, Justin Oberlin and rookie driver Zach Baxter. Heat winners for the Limited Stocks were Travis Brown and Jason Chronister. Trail-Way Speedway is back in action next Friday, July 27, 2018, with the second and final leg of the Lincoln Speedway/Trail-Way Speedway 358 Sprint Car Shootout. Joining the Sprints will be the 600 & 270 Micro Sprints, the Central PA Legends National Qualifier, and the Classic Racing Series’ Lyle Adcock Memorial. Gates open at 5:30 p.m. with heats scheduled to begin at 7:45 p.m. Feature (25 Laps) - 1. 77-David Holbrook, ; 2. 99-Joe Trone Jr, ; 3. 44-Dylan Norris, ; 4. 66A-Cody Fletcher, ; 5. 44X-Dave Brown, ; 6. 20-Devin Beidel, ; 7. 77K-Steven Kisamore, ; 8. 19D-Wyatt Hinkle, ; 9. 48-Nat Tuckey, ; 10. 28-Austin Kirby, ; 11. 34-Mark Van Vorst, ; 12. 51-Austen Treuchet, ; 13. (DNF) 13A-Trevin Caruccio, ; 14. (DNF) 35-Steve Owings, ; 15. (DNF) 511-John Sharpe, ; (DNS) 39-Jason Cunningham Jr, ; (DNS) 12-Mike Bittinger. No time. 358 Sprint Heat 2 Finish (10 Laps/All Qualify) - 1. 77-David Holbrook, ; 2. 66A-Cody Fletcher, ; 3. 44X-Dave Brown, ; 4. 39-Jason Cunningham Jr, ; 5. 19D-Wyatt Hinkle, ; 6. 13A-Trevin Caruccio, . No time. Feature (20 Laps) - 1. 20-Cory Myers, ; 2. 1-Brian Marriott, ; 3. 6-Tim Mc Clelland, ; 4. 44-Steven Cox, ; 5. 96-Brock Whisler, ; 6. 46-Colton Hendershot, ; 7. 29C-Jeff Arigo, ; 8. 16-Keera Dupler, ; 9. 4T4-Joe Long Jr, ; 10. 03-Branstin Shue, ; 11. 28-Matt Frick, ; 12. 66-Tom Gaylor, ; 13. 21X-Brady Gossert, ; 14. 09-John Horton, ; 15. 11T-Olivia Thayer, ; 16. (DNF) 21G-Luis Gonzalez Jr, ; 17. (DNF) 49-Doug Yingling, ; 18. (DNF) 12-Bryce Trone, ; 19. (DNF) 03T-Troy Fickes, ; 20. (DNF) 21-Zachary Cool, ; (DNS) 7-Brent Mowery, ; (DNS) 47-Bobby Lamond, ; (DNS) 3-Connor Bollinger. No time. 270 Micro Heat 3 Finish (8 Laps/All Qualify) - 1. 20-Cory Myers, ; 2. 16-Keera Dupler, ; 3. 6-Tim Mc Clelland, ; 4. 29C-Jeff Arigo, ; 5. 11T-Olivia Thayer, ; 6. (DNF) 7-Brent Mowery, ; (DNS) 66-Tom Gaylor. No time. Feature (20 Laps) - 1. 21W-Will Walls, ; 2. 4J-Jim Jacobs, ; 3. 25-Sam Gallagher, ; 4. 81F-Gary Calimer Jr., ; 5. 51-Jeremy Stremmel, ; 6. 60-Aaron Beard, ; 7. (DNF) 3D-Shane Mc Quay, ; 8. (DNF) 2W-Brian Walls, ; (DNS) 94-Dalton Myers, ; (DNS) 94R-Rick Blizzard, ; (DNS) 69-Tyler Harman. No time. Street Stock Heat 1 Finish (8 Laps/All Qualify) - 1. 2W-Brian Walls, ; 2. 25-Sam Gallagher, ; 3. 81F-Gary Calimer Jr., ; 4. (DNF) 94-Dalton Myers, ; 5. (DNF) 94R-Rick Blizzard, ; (DNS) 69-Tyler Harman. No time. Street Stock Heat 2 Finish (8 Laps/All Qualify) - 1. 21W-Will Walls, ; 2. 4J-Jim Jacobs, ; 3. 51-Jeremy Stremmel, ; 4. 60-Aaron Beard, ; 5. (DNF) 3D-Shane Mc Quay, . No time. Feature (15 Laps) - 1. 12-Kyle Rohrbaugh, ; 2. 38-Jason Chronister, ; 3. 6-Matt Worley, ; 4. 88-Justin Oberlin, ; 5. 56-Zach Baxter, ; 6. 32-Jeff Foster, ; 7. 41-Cody Klinedinst, ; 8. 36-Bobby Wellman, ; 9. 23-Boomer Teague, ; 10. 270-Daniel Haberle, ; 11. (DNF) 81-Matt Chronister, ; 12. (DNF) 92-Terry Hartlaub, ; 13. (DNF) 69-Robbie Carroll, ; 14. (DNF) 14-Carl Cassell, ; 15. (DNF) 47-Travis Brown, ; 16. (DNF) 99X-Creden Sponseller Jr, ; (DNS) 69G-Danny Fox, ; (DNS) 22-Chad Martin. No time. Limited Stock Heat 1 Finish (6 Laps/All Qualify) - 1. 47-Travis Brown, ; 2. 6-Matt Worley, ; 3. 32-Jeff Foster, ; 4. 56-Zach Baxter, ; 5. 99X-Creden Sponseller Jr, ; 6. 23-Boomer Teague, ; 7. 270-Daniel Haberle, ; 8. (DNF) 69G-Danny Fox, ; 9. (DNF) 22-Chad Martin, . No time. Limited Stock Heat 2 Finish (6 Laps/All Qualify) - 1. 38-Jason Chronister, ; 2. 69-Robbie Carroll, ; 3. 81-Matt Chronister, ; 4. 12-Kyle Rohrbaugh, ; 5. 88-Justin Oberlin, ; 6. 92-Terry Hartlaub, ; 7. 41-Cody Klinedinst, ; 8. (DNF) 14-Carl Cassell, ; 9. (DNF) 36-Bobby Wellman, . No time.